Streptococcus pluranimalium is a new member of the Streptococcus genus isolated from multiple different animal hosts. It has been identified as a pathogen associated with subclinical mastitis, valvular endocarditis and septicaemia in animals. Moreover, this bacterium has emerged as a new pathogen for human infective endocarditis and brain abscess. However, the patho-biological properties of S. pluranimalium remain virtually unknown. 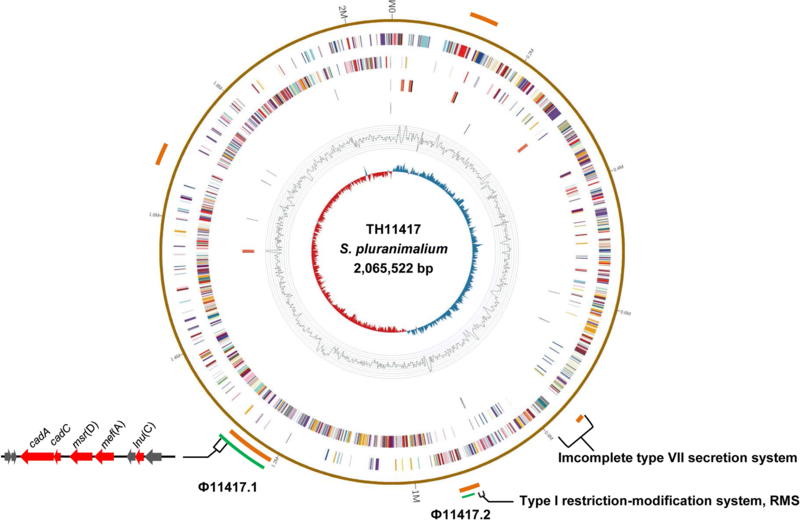 The aim of this study was to determine the complete genome sequence of S. pluranimalium strain TH11417 isolated from a cattle with mastitis, and to characterize its antimicrobial resistance, virulence, and carbon catabolism. The genome of S. pluranimalium TH11417, determined by single-molecule real-time (SMRT) sequencing, consists of 2,065,522 base pair (bp) with a G + C content of 38.65%, 2,007 predicted coding sequence (CDS), 58 transfer RNA (tRNA) genes and five ribosome RNA (rRNA) operons. It contains a novel ISSpl1 element (a memeber of the IS3 family) and a Ф11417.1 prophage that carries the mef(A), msr(D) and lnu(C) genes. Consistently, our antimicrobial susceptibility test confirmed that S. pluranimalium TH11417 was resistant to erythromycin and lincomycin. However, this strain did not show virulence in murine pneumonia (intranasal inoculation, 107 colony forming unit – CFU) and sepsis (intraperitoneal inoculation, 107 CFU) models. Additionally, this strain is able to grow with glucose, lactose or galactose as the sole carbon source, and possesses a lactose-specific phosphoenolpyruvate-dependent phosphotransferase system (PTS). We reported the first whole genome sequence of S. pluranimalium isolated from a cattle with mastitis. It harbors a prophage carrying the mef(A), msr(D) and lnu(C) genes, and is avirulent in the murine infection model. Streptococcus pluranimalium was first described as a new species of the Streptococcus genus in 1999 by Devriese et al. . In sharp contrast with rather strict host restriction of many other streptococcal species, S. pluranimalium is promiscuous, in terms of its host and tissue tropism since it has been isolated from various tissues of multiple domestic animals and humans. In recent years, S. pluranimalium has been regarded as a pathogen associated with subclinical mastitis in dairy cows , many bovine reproductive diseases (abortion, stillbirth, vulvitis, vaginitis and metritis) , valvular endocarditis and septicaemia in adult broiler parents , septicaemia in Nile tilapia . Furthermore, this bacterium has been isolated from human patients with subdural empyema, infective endocarditis, and brain abscess [5–7]. However, the biological properties and pathogenic mechanisms of S. pluranimalium are virtually unknown at the present time. The previous S. pluranimalium isolates are oftern characterized by protein mass spectrometry and 16S rRNA sequencing [1, 3, 8]. Phylogenetic relationship of this species with the other members of the Streptococcus genus has been established with the sequences of selected genes (e.g. 16S rRNA, rpoB, sodA, tuf, rnpB, gyrB, dnaJ, recN, and greL) [9, 10]. Characterization of genomic features of this new member of the Streptococcus genus contributes to better understand its resistance, virulence potential and phylogenetic relationship among Streptococci. However, the complete genome of S. pluranimalium has not been reported. The aim of this study was to sequence and analyze the whole genome of a S. pluranimalium isolated from a cattle with mastitis. This strain was further evaluated, in terms of its antimicrobial resistance, virulence and carbon catabolism. S. pluranimalium strain TH11417 was isolated in 2015 from the milk of a cattle with mastitis in Henan province, China. The strain was cultured in Todd-Hewitt broth (Oxoid Ltd., London, UK) supplemented with 0.5% yeast extract (THY) and on tryptic soy agar (Oxoid) with 5% (v/v) sheep blood at 37 °C. The 16S rRNA classification was performed according to a standard procedure using primers: Pr1 5’-AGAGTTTGATCCTGGCTCAG-3′ and Pr2 5′- ACGGCTACCTTGTTACGACTT-3′. The genomic DNA was extracted using Bacterial DNA Kit (Omega Bio-tek, Norcross, GA), according to the manufacturer’s instructions. The genome sequencing of S. pluranimalium TH11417 was performed on a PacBio RSII single-molecule real-time (SMRT) sequencing instrument (Pacific Biosciences, Menlo Park, CA). The average sequencing coverage was approximately 317× across the genome. The reads were assembled de novo using the hierarchical genome assembly process (HGAP) with the default settings of the SMRT Analysis v2.3.0 software package (Pacific Biosciences). The genome was annotated through the NCBI prokaryotic annotation pipeline (https://ncbi.nlm.nih.gov/). The possible genomic islands (GIs) from TH11417 genome were predicted using IslandViewer 4 (http://www.pathogenomics.sfu.ca/islandviewer/), and prophage components were predicted according to the PHAST (http://phast.wishartlab.com/). Genome maps of TH11417 was generated using Circos v0.64 software . The comparative analysis of prophage and type VII secretion system (T7SS) was generated using EasyFig v2.2 software (http://mjsull.github.io/Easyfig/files.html). Phylogenetic tree was constructed using core genome containing 352 single-copy core genes of 68 members in the genus Streptococcus (67 Streptococci from NCBI GenBank and one in this study). The single-copy core genes were determined using the program OrthoMCL version 2.0 as described previously [12, 13]. The orthologous protein sequences were aligned and concatenated using ClustalW version 2.0 . The concatenated proteins to infer the organismal phylogeny were analyzed using approximately-maximum-likelihood algorithm in FastTree version 2.0 . The mapping of S. pluranimalium was generated by iTOL v4.0.3 (http://itol.embl.de/). The antibiotic susceptibility was determined as minimal inhibitory concentration (MIC) using the broth microdilution method, following the guidelines of the Clinical and Laboratory Standards Institute . The following antimicrobial agents were used: penicillin, cefotaxime, erythromycin, lincomycin, clindamycin, doxycycline, which were obtained from Sigma (Shanghai, China). S. pneumoniae ATCC 49619 was used as the quality control strain. The virulence of S. pluranimalium TH11417 was evaluated in murine pneumonia and sepsis models. Briefly, bacteria were grown to the mid-log phase and stored in 15% glycerol at − 80 °C for 2 days. Stocked bacteria were diluted in Ringer’s solution (RS) to appropriate dose for infection. For pneumonia model, groups of 6 female C57BL/6 mice (6–8 weeks old, Vital River, Beijing, China) were anesthetized by avertin through intraperitoneal (i.p.) injection and inoculated with 1 × 107 CFU bacteria in 30 μL RS by intratracheal (i.t.) instillation. For sepsis model, mice were infected by i.p. with 1 × 107 CFU bacteria in 200 μL RS. Every 24 h post infection, blood samples (20 μL) were collected from suborbital vein and plated on TSA plates with 5% (v/v) sheep blood for counting bacterial number, and the survival of mice were observed up to 7 days. The metabolic capacity for carbohydrates was evaluated by monitoring the growth of S. pluranimalium TH11417 in the presence of different sugars as the main carbon source. Briefly, bacterial cells were cultivated in a chemically defined medium (CDM) as previously described , supplemented with 0.5% different carbon sources (glucose, lactose and galactose), respectively. Carbohydrates were purchased from Sigma (Shanghai, China). The growth phenotype was monitored by a BioTek Synergy H1 microplate reader (BioTek, Winooski, VT, USA) at 37 °C with 200 μl in each well, with the optical density at 620 nm (OD620) of each sample recorded every 30 min up to 24 h.
The TH11417 genome is composed of 2,065,522 bp with a G + C content of 38.65%. It consists of 2,007 predicted CDS, 58 tRNA genes and 5 rRNA operons (Fig. 1). Five genomic islands and two prophage regions were predicted by Island Viewer and PHAST, respectively. The first prophage, designed as Ф11417.1, is 52,668 bp in length and contains 53 CDS; the second prophage (named Ф11417.2) consists of 8,104 bp with 12 CDS. Phylogenetic analysis showed that S. hyovaginalis, S. thoraltensis, S. halotolerans, and S. pluranimalium form the pluranimalium group in the genus Streptococcus based on the distances calculated by approximately-maximum-likelihood algorithm (Fig. 2). TH11417 was resistant to erythromycin (MIC = 16 μg/mL), lincomycin (MIC = 64 μg/mL), and susceptible to penicillin (MIC < 0.125 μg/mL), cefotaxime (MIC < 0.125 μg/mL), clindamycin (MIC = 0.25 μg/mL), doxycycline (MIC = 0.25 μg/mL). The analysis of whole genome indicated that it contains the mef(A), msr(D) and lnu(C) genes, which confer resistance to erythromycin and lincomycin. These resistance determinants are associated with a 52.7-kb chimeric genetic element composed of a transposon inserted into the Ф11417.1 prophage. This transposon contains the heavy metal transporter ATPase and efflux system accessory genes, mef(A) and msr(D) resistant genes, and a mobile element ISSag10 carrying lnu(C) gene. The ISSag10 is inserted to upstream of mef(A), generating two direct repeats (DRs) (TTCTTATT) (Fig. 3a). A new 1,430-bp insertion sequence (IS) belonging to IS3 family was identified in TH11417 and designated as ISSpl1. It is flanked by 20/25-bp imperfect inverted repeats and contains two open reading frames, which encode 178- and 304-amion-acid proteins. The whole ISSpl1 shows 81% identity to the IS861, which was firstly characterized in S. agalactiae COH-I . Four copies of ISSpl1 were observed throughout the chromosome of TH11417, and one of the copies lacking the target sequence is located near to the genes involved in bacteriocin synthesis, other copies create 3-bp directly repeated sequences at the target site (TTC, ATT, GGG) (http://www-is.biotoul.fr/). Analysis of the whole genome of the TH11417 revealed that it harbors several virulence-associated factors, including fibronectin-binding protein, hemolysin III homolog, cell wall anchored protein sortase and LPXTG-anchored protein, IgA1 protease. The fibronectin-binding protein and hemolysin III protein of TH11417 display high identity at protein level with the same pluranimalium group and other streptococcal species whose genomes have been published in the NCBI database, 93.3 and 92.6% with S. thoraltensis DSM 12221 (NZ_KB904587), 91.4.0 and 88.9% with S. halotolerans (NZ_CP014835), 90.4 and 83.3% with S. hyovaginalis (NZ_ATVP01000004, NZ_ATVP01000012), respectively. BLASTp analysis showed that cell wall anchored protein sortase and LPXTG-anchored protein of TH11417 display moderate identity with that of many other streptococcal species. The IgA1 protease of TH11417 display low identity with that of many other streptococcal species. Together, the IgA1 protease in TH11417 has relatively higher specificity than other virulence-associated factors. As shown in Fig. 3b, the TH11417 genome carries a type VII secretion system (T7SS) harboring secretory antigenic target ESAT-6 (substrate protein, EsxA), secretion accessory protein EsaA and EsaB, secretion system component EssA, EssB, and EssC proteins. 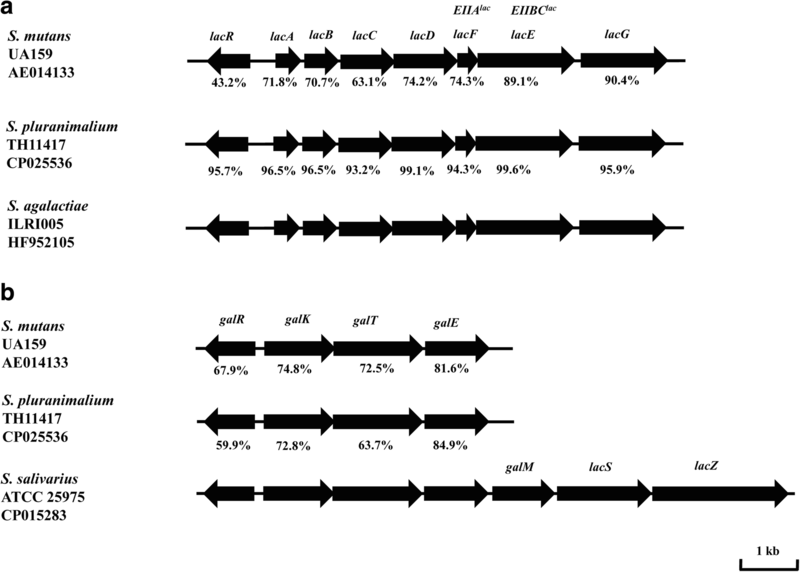 However, the T7SS locus is interrupted by many hypothetical genes between esxA and esaA. EsxA of TH11417 was found to show 96.9% amino acid identity to the corresponding protein of S. thoraltensis DSM 12221 (NZ_KB904587), moderate identity to that of S. suis 05HAS68 (CP002007) (58.8%) , and 44.3% identity to that of Staphylococcus aureus Mu50 (BA000017) . The other related secretion proteins were illustrated in detail (Fig. 3b). In addition, the several hypothetical proteins of T7SS were predicted as genomic island by Island Viewer software. So, we speculated that this T7SS is incomplete and defective. To verify whether these putative virulence factors confer pathogenicity to S. pluranimalium, TH11417 was used to infect mice at a dose of 1 × 107 CFU in both acute pneumonia and sepsis models that have been used to assess the virulence of S. pneumoniae . No bacteria were detected in the blood of mice infected by either i.t. (pneumonia) or i.p. (sepsis) 24 to 48 h post infection. All of the mice survived without any obvious symptom more than 7 days post infection. This result strongly suggested that TH11417 is relatively low- or avirulence. The ability of S. pluranimalium TH11417 to grow with glucose, lactose and galactose as the main carbohydrate source was evaluated in CDM medium supplemented with single carbohydrate. As presented in Fig. 4, TH11417 grew in the presence of glucose, lactose, or galactose. As expected, the CDM with glucose yielded the most productive growth as evidenced by the doubling time in the exponential phase (6 h) and maximal culture density (OD620 1.4). In contrast, the medium containing lactose or galactose showed much slower growth. Although TH11417 showed the longest lag phase in the lactose CDM but eventually showed a second highest maximal density (OD620 1.0), suggesting that lactose metabolism requires extra time for induction. Analysis of the TH11417 genome revealed that it harbors intact lactose and galactose metabolism loci (lacRABCDFEG and galRKTE). The lactose metabolism locus consists of 8 genes (lacR and lac operon of 7 genes: lacABCDFEG). 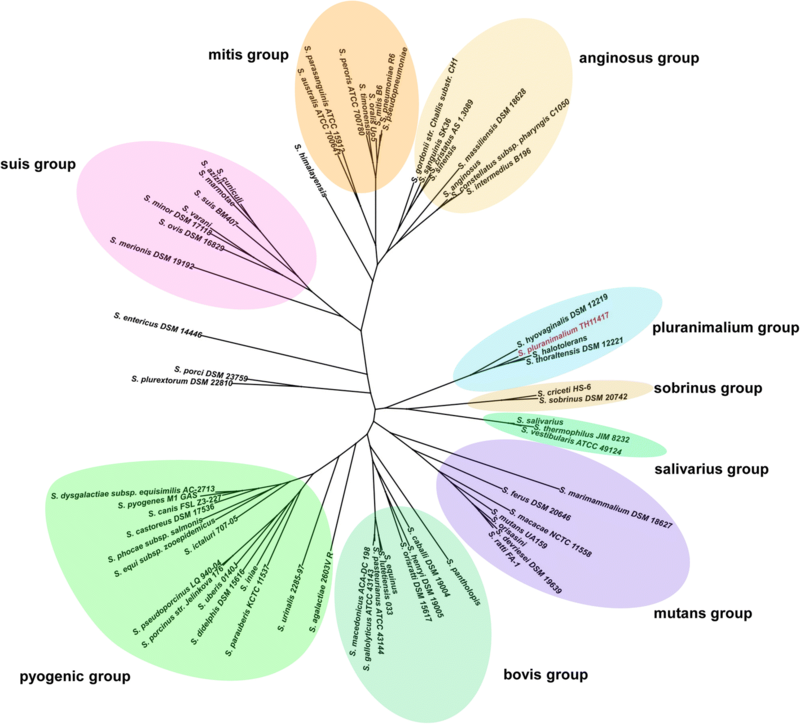 The genes in the lac locus of S. pluranimalium are highly similar to those of S. agalactiae ILRI005 in gene organization and amino acid sequence  (Fig. 5a). As an example, lacC, the least similar gene in the locus between the two species, has 93.2% sequence identity. In contrast, the lac operon of S. pluranimalium has much lower overall sequence homology with that of S. mutans UA159 [23, 24], a well-characterized oral streptococcus (Fig. 5a). The gal operon (galRKTE) in TH11417 also has the same organization as in S. salivarius ATCC 25975 , however, the lactose permease lacS is absent (Fig. 5b). These results indicated that S. pluranimalium TH11417 is capable of transporting and metabolizing lactose though lactose PTS and tagatose 6-phosphate pathway. S. pluranimalium, was first identified by Devriese et al. In 1999 . Since then, this new Streptococcus was isolated from different animals and humans. However, the complete genome of S. pluranimalium is still unknown. In this study, we determined the complete genome sequence of S. pluranimalium TH11417. The genus Strepococcus has been divided into nine major groups (mutans, bovis, pyogenic, suis, mitis, anginosus, pluranimalium, sobrinus, and salivarius) . 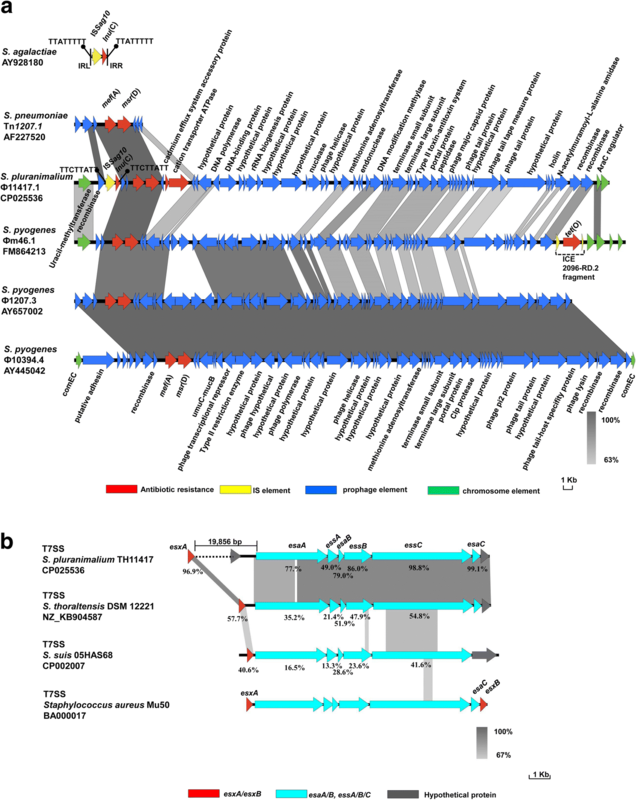 Phylogenetic analysis of the TH11417 genome has confirmed that S. pluranimalium forms the pluranimalium group with S. hyovaginalis, S. thoraltensis, and S. halotolerans (Fig. 2). Moreover, the S. pluranimalium genome is closely related to the streptococcal genomes in the sobrinus and salivarius groups, suggesting that pluranimalium is ancestral to these two groups (Fig. 2). Notably, S. gordonii belongs to mitis group based on analysis of the 16S rRNA gene , whereas S. gordonii was classified as anginosus group by single-copy core genes as well as called gordonii group using eight phylogenetic markers . This study, for the first time to our best knowledge, revealed that three drug-resistance determinants mef(A), msr(D) and lnu(C) coexist in a single prophage. The mef(A) gene encodes an efflux pump exhibiting resistance to macrolides, and susceptibility to lincosamides and streptogramin B antibiotics, which was originally described in S. pyogenes in 1996 . The msr(D) gene, one of the ABC-F subfamily of ATP-binding cassette proteins, mediate macrolide resistance through ribosomal protection . The msr(D) gene along with mef(A) was previously found on the defective transposon Tn1207.1 in S. pneumoniae, which could not be transferred by conjugation experiment . However, an originally called Tn1207.3 conjugative transposon carrying this mef(A)/msr(D) pair of genes could be transferred in different streptococcal species. Now, the Tn1207.3 was re-named as a prophage Ф1207.3 in S. pyogenes . Including lnu(C) gene conferring resistance to lincomycin, several different genes have been identified and deposited in the nomenclature centre for MLS resistance genes (http://faculty.washington.edu/marilynr/), which inactivate lincosamides by adenylylation in Staphylococcus, Enterococcus, Streptococcus, Haemophilus parasuis, Riemerella anatipestifer. The ISSag10 bearing lnu(C) was first identified in S. agalactiae UCN36 in 2005, which was inserted in the operon for capsular synthesis, and generated both DRs (TTATTTTT) . In the present study, the ISSag10 is simply inserted to a transposon resembling Tn1207.1 of S. pneumoniae  (Fig. 3a). At the sequence level, Ф11417.1 has low homology to Фm46.1, Ф1207.3 and Ф10394.4 from S. pyogenes, except for Tn1207.1-like elements [30, 32, 33]. Interestingly, the Ф1207.3 and Ф10394.4 integrate into comEC coding sequence at the same chromosomal site, whereas Ф11417.1 as well as Фm46.1 integrates into the gene encoding 23S rRNA uracil methyltransferase (Fig. 3a). These results indicated that S. pluranimalium TH11417 could acquire the resistance determinants through phage horizontal transfer. This study has identified a type VII secretion system (T7SS)-like locus in S. pluranimalium. T7SS, the newest secretion system in prokaryotic organisms, are found in certain Gram-positive pathogens, including Mycobacteria tuberculosis and Staphylococcus aureus . Very recently, Lai et al. reported a type VII secretion system in S. suis which contributes to virulence in a mouse infection model . Although multiple virulence associated factors are found in the genome of S. pluranimalium TH11417, this strain did not show obvious virulence in both the pneumonia and sepsis mouse models. Because previous studies have shown that S. pluranimalium is associated with diseases in domestic animals and humans [1–6], it is possible that TH11417 is specialized in colonizing the bovine environment and lacks certain factors for successful infection in mice. The availability of the TH11417 genome will help future investigations into the genetic basis of pathogenesis and biology in this species. Lactose is the primary carbon and energy source used by some Streptococcus strains for growth in milk . In this study, we isolated S. pluranimalium TH11417 from a cattle with mastitis, which is capable of metabolizing lactose and galactose. There are multiple systems to transport/metablize a single substrate in bacteria [36, 37]. In lactose metabolism, the β-galactosidase (LacZ) is the predominant metabolic system through lactose permease (LacS) for S. salivarius 25975, while the lactose-PTS is the major metabolic pathway for S. mutans, both of which were induced by lactose . Like bovine-adapted S. agalactiae , S. pluranimalium TH11417 could also metabolize lactose and galactose by two distinct pathways: tagatose 6-phosphate (lac) and Leloir (gal) passways. In S. salivarius and S. thermophilus, lactose is not transported by lactose-specific PTS, but solely through lactose permease (LacS), which is cleaved by β-galactosidase (LacZ). However, S. salivarius is able to metabolize galactose via the Leloir pathway, while S. thermophilus doesn’t metabolize galactose because galK gene is poorly translated [25, 39]. In the present study, TH11417 strain harbors intact lac and gal operons, but the lactose permease lacS is absent. The genotypes are consistent with the poor growth in CDM medium with 0.5% lactose during the first 6 h of incubation, suggesting that the lactose-PTS is the primary metabolic pathway for lactose. In conclusion, we reported the first whole genome sequence of S. pluranimalium isolated from a cattle with mastitis. The analysis of whole genome revealed that TH11417 harbors a chimeric Ф11417.1 prophage carrying Tn1207.1-like and ISSag10 transposons, and several putative virulence factors, such as a fibronectin-binding protein and a type VII secretion system-like locus. S. pluranimalium TH11417 transports and metabolizes lactose though lactose PTS and tagatose 6-phosphate pathway. This complete genome will be highly valuable for the genetic basis of biology and pathogenesis in this species. Yushan Pan and Haoran An contributed equally to this work. This work was supported in part by the Science and Technology Key Project Foundation of Henan Province (No. 132102110126) and the National Natural Science Foundation of China (grant No. U1504326). The funding bodies had no role in the design of the study and collection, analysis and interpretation of data and in writing the manuscript. All data generated or analyzed in this study are included within the article and its additional files. The complete genome sequence of S. pluranimalium TH11417 determined in this study has been deposited in the GenBank database under accession no. CP025536. The new insert sequence ISSpl1 have been deposited in the ISfinder database (http://www-is.biotoul.fr/). YSP and GZH conceived and designed the experiments; HRA, TF, SYZ and XFZ carried out sample collection, processing, antimicrobial testing, and animal experiments; CWZ and GHX carried out carbon catabolism experiment; YSP, HRA and JRZ analyzed the data; YSP and HRA drafted the manuscript; JRZ revised the paper. All authors read and approved the final manuscript. All animal experiments were performed in accordance with the principles in the Chinese law on the humane use of animals for scientific use, and approved by the Institutional Animal Care and Use Committee in Tsinghua University with the animal protocol number 14-ZJR1.